In Italian, crudo means raw. 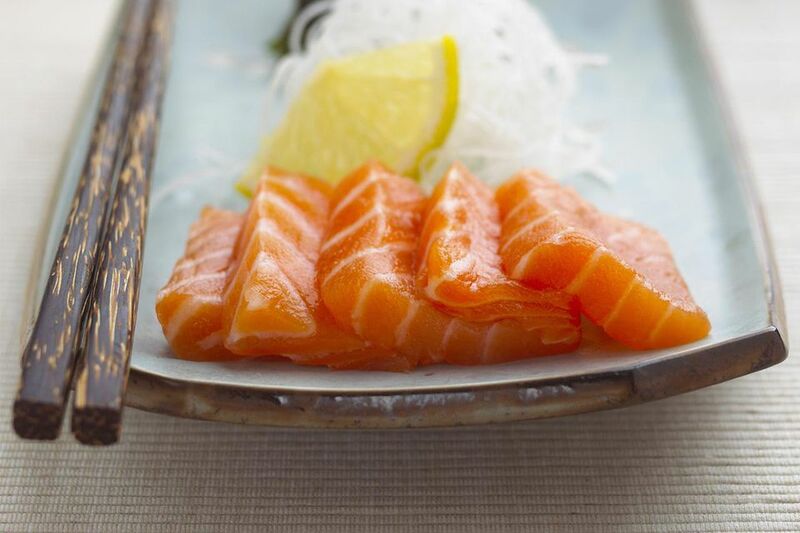 Similar to sashimi, Italian crudo is raw fish eaten at the peak of freshness, dressed simply, with olive oil and lemon. It is a way to highlight the finest quality fish you can purchase. This recipe for tuna crudo is a classic Italian dish, combining regional flavors such as Meyer lemon, olive oil, and basil. You can also make this dish using any fish you might find at a sushi bar, including seabass and halibut. Not only is this recipe delicious and simple, it's also healthy. Buy a piece of fish you can later cut, across the grain of the meat, into squares or rounds of at least two inches across. You may need to buy more fish than you need to get the presentation right. Use the excess in either a tartare or a stir-fry. Wrap the fish tightly in plastic and put it in the freezer for an hour or more. After an hour, check to see if it is hard—but not solid. When it reaches that state, take it out and get your sharpest knife. Slice the fish across the grain as thin as you can. I shoot for a cut of about 1/8-inch. Do not pound it to make it flatter. (That's carpaccio, not crudo). Coat the slices in the olive oil and set in a sealed container in the refrigerator over a bed of ice for at least 20 minutes, or up to an hour. To serve, take the fish out of the fridge. On the plate, pour some olive oil (which you did not use in the marinade) on the plate and arrange the slices over it. Each guest should get a quarter of the lemon and a tiny bowl of the sea salt, or you can salt the fish right before serving. If you do not have top-quality ingredients to make this dish, save it for a time when you have access to sushi-grade fish.